Farmers in my area are increasing their use of base-price contracts to sell their current and (especially) future soft white wheat (SWW) crops. Until 2007, the SWW basis (the Portland cash price of SWW minus the nearest Chicago futures price) fluctuated around 44 cents and was usually positive sometime during the early fall. Since 2007, the basis has fluctuated erratically and spent most of the time in negative territory. Since a strengthening basis (i.e., a basis that becomes more positive or less negative) adds to the net return from a base-price contract, understanding why the basis has been staying so negative has been a topic of considerable interest to my neighbors and me. Two years ago, I discussed this issue in one of my first blog entries. I explain why the basis should average 44 cents in this article. In trying to understand why the basis has been negative for so much of the time since 2007, I’ve focused on the “convergence problem” problem in Chicago futures. The futures price has often remained above the cash price of SRW wheat when futures contracts expire. This isn’t supposed to happen and could contribute to the negative WW basis. After several years of study, the Chicago Mercantile Exchange has failed to correct the “convergence problem” and I was beginning to wonder whether they really were serious about dealing with it. However, I now think this lack of convergence is largely irrelevant in explaining our persistent negative basis. My thinking changed in late October when I attended a U.S. Wheat Associates Board meeting in Minneapolis. I attended a panel discussion including Mike Ricks, a senior manager for Cargill. Listening to Mr. Ricks caused me to start thinking about basis in a new way. The classic theory of futures markets argues that their main function is to facilitate hedging. Normally, short hedgers (farmers and grain elevators) outnumber long hedgers (grain buyers and millers) so the market needs to attract long speculators to buy the extra contracts that short hedgers want to sell. The Chicago wheat futures market began to change the way it functions around 2006, when “long-only index” funds started building their positions in the wheat market. These funds hold wheat futures contracts as a hedge against possible “food price inflation.” They aren’t concerned about the current price of futures or short-run changes in the supply and demand for wheat—they just want to be long futures. Shortly before each contract expires, they roll their positions to the next available contract month. “Long-only index” funds now hold a huge and dominant position in the Chicago wheat futures market. They hold contracts for at least 1.2 billion bushels—more than five times the size of this year’s soft red wheat crop. Just as hedgers previously had to attract long-speculators to offset their net short positions in the market, the “long-only index” funds now need to attract short sellers to hold the other side of their huge long positions. How do you attract new sellers willing to take short positions totaling 1.2 billion bushels? Attracting the necessary supply of short-speculators might be difficult—since naked short speculation is risky when inflation is a worry. However, new hedgers can also be attracted into the market to take the necessary short positions. As the futures price rises above the cash price of wheat (i.e., the basis becomes more negative), hedging by owners of physical stocks of wheat looks more and more profitable—giving grain handlers and farmers an incentive to delay selling the crop so they can store and hedge more wheat. Because hedgers hold a long position in the physical wheat, their short position in the futures market seems less risky than the position of a short speculator. By being willing to take the other side of the futures contracts that the “long-only index” funds buy, hedgers have indirectly allowed the funds to accomplish their real desire—to hold physical wheat. Can the Basis Return to Normal? Why Do Futures Prices Move with Cash Prices? If “long-only index” funds are focused only on inflation and if hedgers are focused on the basis, what causes movement in the futures price and how are futures prices related to the supply and demand for cash wheat? As argued above, the “long-only index” funds have caused an increase in U.S. wheat carryover and this has at times reduced exports. 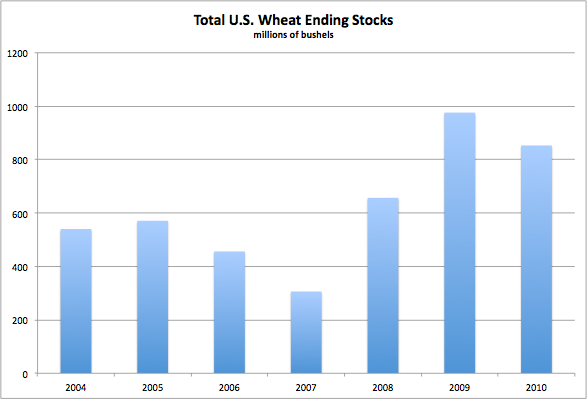 As Mr. Ricks mentioned in Minneapolis, the index funds are causing the U.S. wheat carryover to reach levels that rival the size of the burdensome government stocks in past years. Since about half of U.S. wheat is exported and must be priced competitively on the world market, the cash price of wheat is still predominantly determined by world supply and demand. If the cash prices rise, the basis narrows and hedgers start lifting their hedges and buying futures. This causes futures prices to rise along with cash prices and by enough to keep the necessary number of hedgers in the market. Similarly, if the cash price falls, basis widens and hedging increases. The resulting sale of futures contracts by hedgers causes futures to decline along with cash prices. Mr. Ricks indicated in Minneapolis that Cargill had been giving lots of thought to the question, “How will all this end?” I believe that until “long-only index” funds start liquidating their huge positions, the basis must remain wide and hedgers expecting the return of a “normal” basis may be disappointed. When the “long-only index” funds start reducing their positions by selling their future contracts, the futures price will decline and the basis should initially narrow, i.e., become less negative. Hedgers should then be able to liquidate their hedges at profitable basis levels. As they do, they will sell their stored wheat and cash prices should decline along with futures. If “long-only index” funds liquidate their positions quickly, the cash price of wheat could crash along with futures—as our large carryover stocks are dumped on the market.